You’ve been waiting all year for beach weather and it’s finally looking you right in the face. The trifecta is all around you: the sun, the sand, and the water. Your friends are all enjoying the day by playing in the water and soaking up the sun. A cooler filled to the brim with drinks takes the edge off the heat. This type of days makes the year round humidity all worth it. However, you’re not enjoying it; you’re distracted. It isn’t the usual thoughts of work or bills that fill your mind – it’s your tooth. One of the smallest things in your life now has all your attention. It hurts, and you know taking a cool drink is only going to make it worse. The sun is warm but all your senses are focused on wondering if you have a tooth infection. Many things in life are not thought of until something goes wrong with them: your car, your washer/dryer, and your teeth. Once that little bit of pain begins, it can completely envelop your attention. The question is how do you know if you have a tooth infection as opposed to just needing to brush and floss a little better? There are a few ways you can check on your own. The first indicator is, of course, pain. 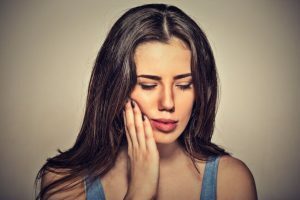 Pain is the body’s natural way of telling you something may be wrong, so the presence of new pain in your teeth is something you should investigate. Even if you don’t have any discomfort, it is always advisable to give your teeth a thorough examination every once in a while. The presence of dark spots or discoloration could be signs of a possible tooth infection. Sensitivity to hot or cold and any swelling of the gums and cheek are signs as well. Tooth infections do not stop simply with the initial symptoms. Similar to other infections in the body, a tooth infection can only grow worse if untreated. What may start as a simple toothache can progress to a large amount of pain and discomfort. The tooth itself can begin to lose its structure and deteriorate. The infection can even spread beyond the tooth. Here at Juno Beach Smiles, we have a variety of ways to help you if you show signs of a tooth infection. We offer a wide array of restorative dentistry options, such as crowns, bridges, and dental implants. If you come in with a tooth infection, the team will look at your tooth and evaluate which is the best solution for you. Many of these procedures can have the tooth looking good as new and feeling completely pain-free. The best method of care is prevention through consistent oral hygiene, but be sure to come see us at Juno Beach Smiles if you think you are showing signs of a tooth infection.